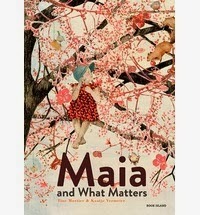 What matters in life is at the core of the outstanding picture book, Maia and What Matters. These are the simple things in life: running through gardens, cake, stories, cherries and most importantly, even more than cake, is Maia's relationship with her grandmother. The story runs a gamut of emotions including joy, confusion, anger and loss. Yet, it is all done with such a deft touch that it opens up the themes of aging, sickness and grief to children in a way I've rarely encountered before in any book. The overarching theme, however, is love and, with extraordinary nuance, Maia's voice remains strong throughout as she seeks to navigate the changes thrust upon her. The story is seen and felt through this young girl. The illustrations are art, powerful and emotive, extending the text and deepening understanding of Maia's world and emotions. Exquisitely detailed and exhibiting a masterful use of colour, any of the spreads could hang on a gallery wall -- even the endpapers. Above all, Maia and What Matters is an uplifting book to be shared between generations. There could be no more gentle or beautiful way to broach death or illness of a loved relative with a child. Quite simply, it is a masterpiece. BIO: Vicki Stanton is the editor and publisher of Buzz Words, an e-zine specifically catering to writers and illustrators for children.